This successful musical play, with which the new Gaiety was opened, is now in its second year, and the second edition which Mr Edwardes has now got in full swing can hardly fail to secure for it a pleasant prolongation of popularity. Among the new numbers mention should be made of an exceedingly pretty song, “On a Summer Afternoon,” given with refreshing piquancy by Miss Gertie Millar; of a charming fishing ballad, “Blanche Marie,” to which every justice is done by Miss Marie Studhohme, and of a capital song “La Promenade Anglaise,” of which not the least attractive feature is the dance which follows and which is executed with the most gracious nonchalance by Miss Gabrielle Ray. A “motor” scene, which eventually resolves itself into a “bathing” medley is a most popular new number, while cheers nightly greet a characteristically Irish ballad, “Kate O’Malley,” allotted to Mr Lionel Mackinder, and winding up with a brisk jig, wherein Miss Olive May greatly distinguishes herself. Special praise must also be accorded to the extremely dainty song, “Sweep,” which now takes the place of the “Pierrot” number in the last scene. In this Miss Gertie Millar wins for herself the unqualified favour of everyone by her amazingly graceful and fascinating method. Mr Edmund Payne, Mr Charles Brown, Mr Harry Grattan, Mr Robert Nainby, Mr James Sullivan, Miss G. Rowlands and Miss Connie Ediss, it is almost needless to add, continue to work with untiring energy for the of the piece, and deservedly meet with enthusiastic receptions nightly. So the famous Gaiety Theatre, in the Strand, is to be reopened. Shades of stage-door johnnies; supper at Romano’s – now no more – and Rules (behind the Adelphi, where Cochran ran two years with “Bless the Bride” and followed it with the less successful “Tough at the Top,” and which still remains pretty much the same); of champagne drunk from a chorus girl’s slipper – and it did happen; and the glamour girls who smiled, sang or danced their way into jewels, wealth and the peerage. Thus, at what the young reporter would call the psychological moment, comes “Gaiety, Theatre of Enchantment” (W. H. Allen, 20s), by that grand historian of the stage. W. Macqueen Pope, himself a figure in many theatrical enterprises through the years. John Hollingshead, who founded the Gaiety, may be just a name, but the matinees he started became world-famous, and he made the theatre part of London’s gaiety itself. George Edwardes, who first joined him later took over, fathered the Gaiety Girl, is still remembered as a fabulous figure surrounded by beauties whose curves and smiles decorated millions of picture postcards, and made some men feel far too young. What oldster doesn’t remember Gertie Millar (later a countess), Marie Studholme (my own young dream), Margaret Bannerman, Belle Bilton, Rosie Boote (who became a marchioness), Camille Clifford, Constance Collier, Ada Reeve, Evie Green, Lily Elsie, Ellaline Terriss, Isobel Elsom, Gaby Deslys (said to have “dethroned” a king), Mabel Love, Kate Vaughan, Nellie Farren, Sylvia Storey (another countess), Edna May, Gabrielle Ray, Gladys Cooper, Phyllis and Zena Dare – even schoolboys collected their pictures. Pope has stories of them all and of the great actors and comedians, the managers, the authors and composers. Stars have their moments now, but their glamour is mostly on celluloid and bobby-soxers and hysterical young women get their clothes torn to get near their favourites (mostly women) when they “appear in flesh.” Compared with these ebullitions the stage-door johnnies were just odd men on a desert island. This is a grand book – 500 pages of stage cavalcade, with 100 pictures (and how queer some of the fashions look). “THE ORCHID” – REVISED VERSION. The best always good enough for most us, but usually because are slow in seeing how the best may improved. The ordinary playgoer would hardly be so bold as to revise a popular comedy like “The Orchid,” for revision of established success is a ticklish task. Last night, however, saw a “re-production” of Mr. Tanner’s musical play, which meant fresh costumes, fresh dialogue in many places, and the insertion of many smart new numbers. For instance, new songs have been given to Miss Gertie Millar, Miss Connie Ediss, Miss Gabrielle Ray, and Miss Marie Studholme, among the ladies; and there were novelties for Mr. Lionel Mackinder, including rattling Irish ditty called “ Kate O’Malley,” followed by the infectious Irish jig from Miss Olive May and the corps all round the stage. One might almost say all round the house, for there were very few members of the audience who could keep their toes still while the thing was on. One of the songs, and certainly the most topical, “The Beauty and the Barge”; another, for Miss Gertie Millar, is “Don’t Mind the Dark.” “Little Blanche Marie” is the title of Miss Studholme’s new success, and one that sure to find an echo of some sort in the pantomimes. The most daring innovation is a “cart-wheel” at the end of one of Miss Gabrielle Ray’s dances, and one could hardly desire more contrast than is provided the dance, which converts a group of automobiles into seaside loungers in bathing attire. The new version “The Orchid,” as we have said enough to show, should give it a new lease of life and run it well into next year, till its successor is ready. The latest date mentioned for Mr George Edwardes to open the new Gaiety is Saturday week. The principals in the New Gaiety’s new play, “The Orchid Hunt,” now include Messrs Payne, George Grossmith, jun., Fred Wright, jun., Harry Grattan, Robert Nainby, Will Bishop, and Lionel Mackinder, and Misses Connie Ediss, Hilda Jacobson, Gertie Millar, Lydia West, Gabrielle Ray, and Ethel Sydney. A Charming Dancer. – Miss Gabrielle Ray as Thisbe at the new Gaiety gives promise of qualifying to win a place in the long roll of famous dancers. 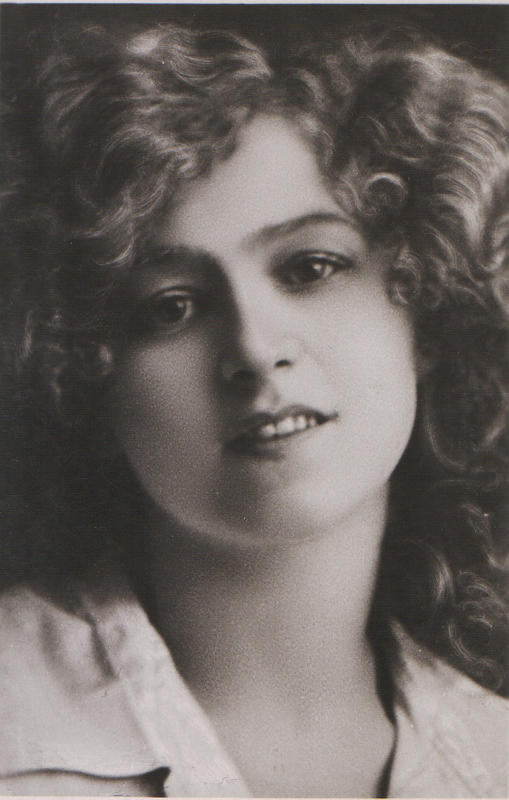 She has been five years in musical comedy, having made a beginning as Mamie Clancy in The Belle of New York with a company toured by Mr. Ben Greet. Then followed two years in his Casino Girl company as Dolly Twinkle, the part originated it the Shaftesbury by Miss Marie George. Four years previous to her engagement by Mr. Ben Greet Miss Ray had appeared as a child actress in a drama called Proof at the Elephant and Castle, and several pantomime parts in the provinces followed. A year ago she went to the Gaiety to under study Miss Gertie Millar in The Toreador, and from there went to the Apollo, where she has played Miss Letty Lind’s and Miss Ella Snyder’s parts without suffering by comparison. Miss Ray is neither French nor American as is surmised but comes from Lancashire.